Still reeling off of UFC 134's fumes, I tuned into ProElite's live stream on Sherdog.com last night. I don't mean to discredit any of the other fighters on this card, but in my personal opinion the star of ProElite's resurrection event was Sara McMann. This female 135lber is a force to be reckoned with in the WMMA world. On a broader note, only one match went the distance, so there's no complaints in the excitement department. I think it's safe to rate ProElite's return a successful one, so far. Body Shop Fitness stablemates Jesse Juarez and Antonio McKee both notched wins in Australia this weekend. 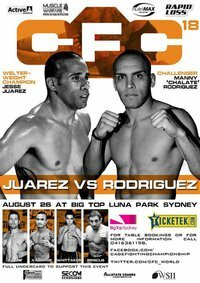 Juarez successfully defended the CFC Welterweight title while McKee submitted his opponent, Jai Bradney, in the first round (no boring decisions here). McKee's next stop -- MFC 32 where he will defend the MFC lightweight title against Brian Cobb in November.